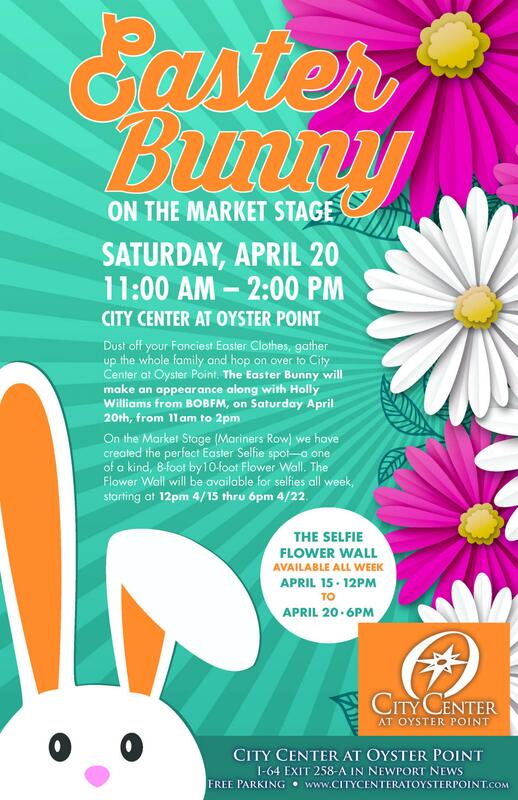 The Easter Bunny will make an appearance along with Holly Williams from BOBFM, on April 20th, from 11am to 2pm. The Flower Wall will be available for selfies all week Starting at 12pm 4/15 thru 6pm 4/22. City Center at Oyster Point Mother's Day Weekend Celebration Saturday, May 11th 11am - 2pm. - Stroll through the Center and enjoy vendors with a variety of art, crafts, fresh fruit and much more. Plenty of stuff to do! Joe Gosman Band performing 11am - 2pm, free train rides, free cake, kid's activities and a free flowering plant to the first 250 women. Live music by The Joe Gosman Band from 11am - 2pm. FREE children's activities and free trackless train rides. Activities include "make-and-takes" for mom: make a Mother's Day card and tissue paper flower. The first 250 women can pick out a free beautiful flowering plant... a special gift of love that grows. A perfect touch of spring for Mom. Fresh, Healthy, Farm to Table choices! The Farmers Market at City Center, Oyster Point is back with all of your favorite vendors! Thursdays from 10a - 2p starting May 16th thru Sept 19th. (No market July 4th). Our variety of vendors offer produce, fresh local fruit, baked goods, fresh poultry and meat- including bison products, seafood, cheese, eggs, soaps, lotions, jam, jelly, spices, flowers, plants, candles, dog treats and plenty more. Hungry? Enjoy a delicious lunch from Big Daddy’s BBQ! Menu varies slightly and includes - BBQ Chicken, Ribs, Pork Chops and sides! Homemade Clam Chowder from Kathi's and do not forget your homemade chips from Tyler. Or you can choose from one many of City Centers permanent eateries who offer a multitude of gourmet choices. The farmers Market is located across from the Market Stage at 703 Mariners Row, City Center at Oyster Point, Newport News. It is a vibrant community of luxurious apartments, distinctive condominiums, modern office buildings, a movie theatre exciting and unique retail shops and restaurants.